But in a world of wild wings and drift modes, the Golf R stands out because it doesn’t go too far. It’s familiar and familial, so does it matter that it’s not VW’s wild child? We’re not kidding around about that twins business. 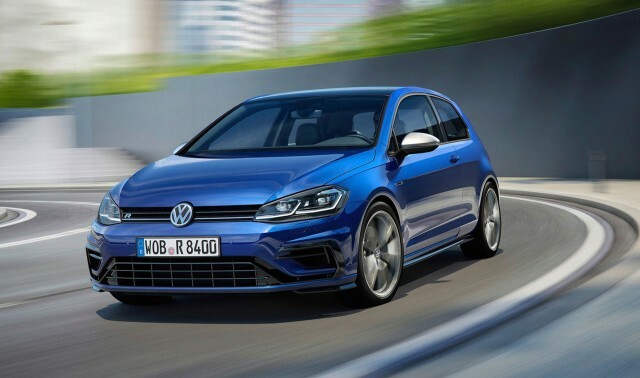 The Golf R’s only visual differences are its 19-inch wheels, slightly lower ride height, an exhaust outlet for each cylinder, and silver accents in place of the GTI’s red. It all feels underwhelming––Volkswagen doesn’t need to go crazy with how its hottest hatchback looks. Still, we’d like the visual gulf between Golfs to be a little wider. Changes to the cabin are similarly restrained, aside from one important detail: the Golf R is the first member of the family to adopt Volkswagen Digital Cockpit as standard. The all-digital display spans 12.3 inches and while it’s not as reconfigurable as Audi’s system, Digital Cockpit is a beautiful and comprehensive way to view driving, multimedia, communications, and navigation data. Digital Cockpit’s interface is more intuitive than Virtual Cockpit, and its controls––limited to just one side of the steering wheel––are simple to operate. While it retains the same page format that Audi’s system uses, the reconfigurable options in the VW get their own page, while the side tabs from Virtual Cockpit are missing all together. There’s still a learning curve, but the centralized and clearly marked customization options make VW’s the better of the two systems. Digital Cockpit aside, the Golf R’s cabin is virtually identical to the GTI’s. This is good for the business of driving––the leather seats are as snug as a good pair of lederhosen, with huge side bolsters that bearhug the driver and front passenger. The black cow hides are standard and that’s a mark against the Golf R––the GTI’s standard tartan cloth is far cooler.